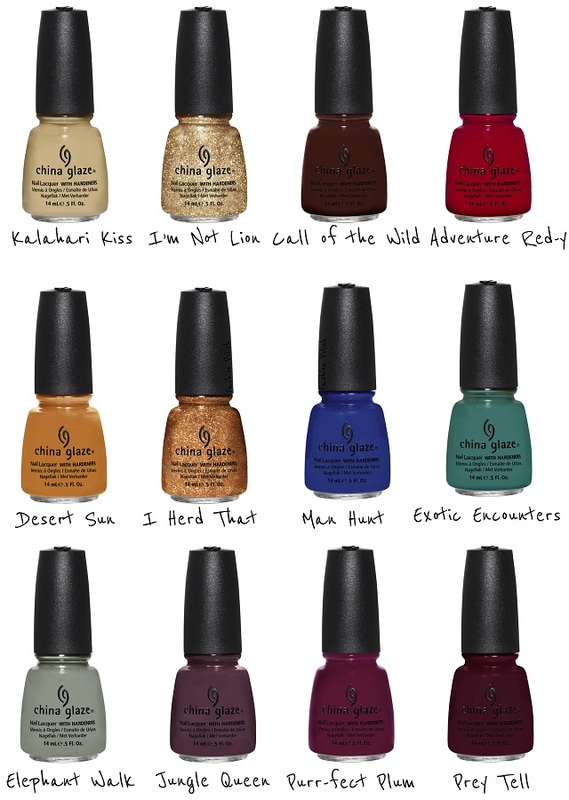 Los Angeles, CA – (June2012): China Glaze® naillacquer invites you to take an exotic expedition with its Fall 2012 collection,On Safari. Be captivated by theearthy tones, rich plums and celestial sparkles that make up this adventurousassortment of polishes. The China Glaze® On Safari collection will be available atfine salons and beauty supply stores nationwide in July 2012. Individual polishesretail for $7 MSRP; the 6-piece sets retail for $42 MSRP. China Glaze is free ofDBP, toluene, and added formaldehyde. China Glaze nail lacquers are availablethrough salons and professional beauty supply stores nationwide. How much is the Native 6 piece collection? I found sellers on amazon that already had this collection; I picked up the glitters and Jungle Queen. All the colors are so so pretty. I've been looking forward to these for months, my wallet is gonna hate me! I like this color story - just not thinking that I will pick up maybe more than 2 of them if that because I have soooo many fall polish shades that are similar and others I love that I never get time to wear.